kalau ada roti yg nak dekat2 expired kat dapur tu.. bole cuba resepi ni.. simple n yummy! NOTA: basahkan cukup sekadar melembapkan roti sahaja.. x perlu habiskan air suam tu pon tak mengapa..
nak lagi sedap boleh buat custard sauce sekali utk jadikan topping/gravy puding ni..
campur semua bahan dlm periuk kecil, masak atas api sederhana, kacau sentiasa supaya tidak berketul.. bila dah pekat (ala2 pekat mcm gravy chicken chop tu) bole padam api.. sedia utk di makan.. bole juga mkn dgn dessert2 lain mcm puding laici ke.. lemon pie ke..
this is my very own FOOD CRITIC.. very fussy yet never fail to give complements if the food taste good.. if she really eats your food.. u should b celebrating coz that tells u u've done good job with the cooking.. worth all the effort to hear she say, "thanx Mama.. i like it soooooo much!" with her warm hugs n kisses..
lets start with Wiki-ed definition of trifle pudding.. Trifle is a dessert dish made from thick (or often solidified) custard, fruit, sponge cake, fruit juice or gelatin, and whipped cream. These ingredients are usually arranged in layers with fruit and sponge on the bottom, and custard and cream on top..
okay.. trifle pudding should have few layers.. must have cake layer at the bottom.. then a custard layer.. followed by fruits layer.. and topped with gelatin..
but there is no right or wrong exactly in cooking.. janji sedap!! 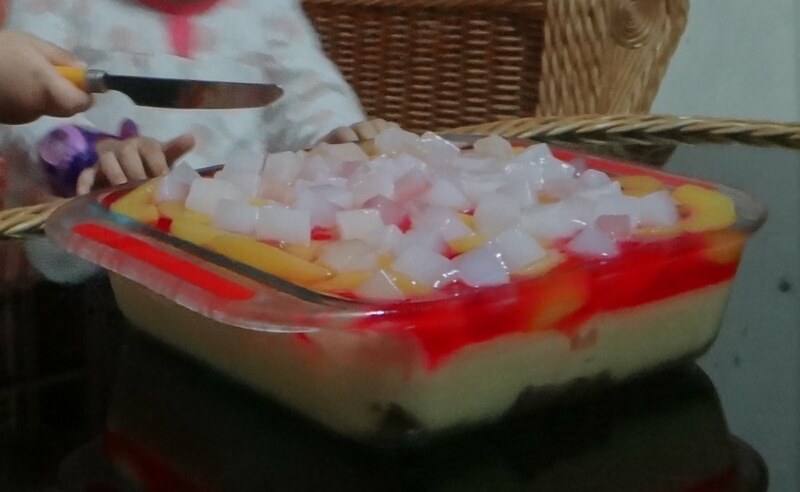 i'm sharing my version of trifle pudding recipe but before that lets look how the finished product will look like..
please ignore the 3 hands and knife.. Aisyah and Nayli were getting ready to dig in.. this trifle was made for Nayli's postponed mini 2nd birthday celebration..
immediately after pouring the jelly mixture, arrange the peaches and nata de coco as the final layer.. it is totally up to you how u want to do it.. let it set in the fridge for at least 1 hour.. then it is READY TO INDULGE! !